Make Extra Storing Space And Keep Your Bathroom, Kitchen, Laundry Room Or Garage Perfectly Organized Thanks To The Ultimate 4 Tier Shelf Unit Which Is Now Available On Amazon! Have you had enough with all the clutter that builds up, turning your rooms into a complete mess? Would you like to find a smart, effective way to save space and make additional storage room so as to keep everything neatly stored? Above Edge presents you with a top quality, 4 tier shelving unit which is exactly what you have been looking for! This incomparably practical storage shelves unit is made of sturdy, water resistant and rust proof material, assuring unmatched durability. What is more, thanks its 1.2lbs weight, it remains perfectly steady at all times, keeping your things secure and neatly stored. This must have kitchen, bathroom, garage and closet shelving unit organizer features a 32'' height, a 12.5'' width and a 7.5'' basket shelf depth. The large size and the deep, steady storage shelves are perfect for organizing your towels, soaps, lotions, perfumes, makeup, cosmetics, hair brushes, jewellery, sponges and anything you can think of! In addition, this freestanding shelves organizer can be used in any room and place you need it, including your garage, kitchen, bathroom as well as under the sink, in your closet or bathroom vanity and cabinets.  MAKE EXTRA STORING SPACE AND KEEP YOUR ROOMS CLEAN: Forget about messy rooms and scattered items once and for all thanks to this top notch corner 4 tier shelving unit! This bathroom and kitchen organizer provides you with ample storing space, allowing you to keep everything neatly stored.  DURABLE, WATER AND RUST RESISTANT MATERIAL: This freestanding shelf unit is made of heavy duty, water resistant and rust proof material which assures incomparable longevity and maximum hygiene. What is more, it is very easy to keep clean using a wipe.  COMPACT, STEADY, PRACTICAL BASKET DESIGN: Featuring a 1.2lbs weight, 32'' height and a 12.5'' width, this bathroom tissue, toilet paper and towel stand can fit just about anywhere. What is more, the 7.5'' deep basket shelves provide enough space for anything you need to store. The special design and sturdy construction offer maximum stability, preventing tumbling accidents. 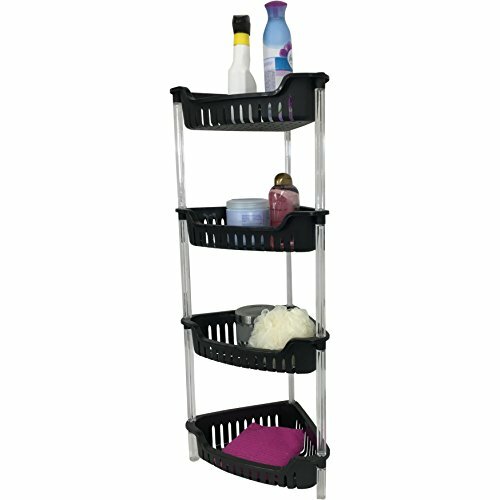  IDEAL FOR EVERY LIVING OR WORKING SPACE: Whether you need to organize and clean up your bathroom, kitchen, garage or laundry room, this shelving unit is a must have for you! The sleek design and the classic white color make this storage stand organizer the perfect addition to any environment.  ORGANIZE YOUR TOWELS, JEWELLERY, TOOLS AND MORE: This corner storage shelf unit is ideal for keeping your towels, tools, tissues, toilet paper, hair brushes, hair products, shampoo and lotion bottles, perfumes, jewellery, soap bars, sponges and anything you need out of the way!